If there was one thing I could have changed about my recent trip to Japan, it would have to be the date. I say that only for the sole reason that it wasn’t sumo tournament season. The ancient form of wrestling holds tournaments at specific times of year; specifically, not while I’m there. Lucky for me, I can get my loin clothed kicks over at Matador. 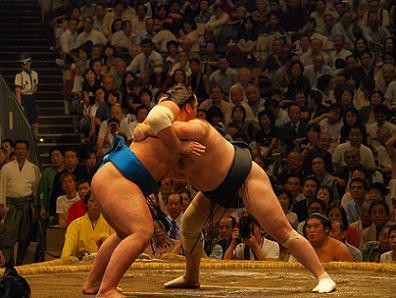 The article lines out a top ten list to do in order to become a sumo. I, and most likely you too, rather enjoy clog free arteries and a relatively bruise free breast bone, so I’ll pass on the six whopper a day training regimen. Sumo, as I previously saw it, isn’t the train wreck that it seems to the untrained eye. You know, the kind of situation you catch yourself looking at, but don’t really want to be watching. As it turns out, the sport has its specific nuances and traditions, along with its unique athletes. Although, I can’t help but think, it’s still a train wreck of sorts — two giant colliding freight trains — I guess I’ll just stick to those silly, inflatable costumes, for now.